Generously salt and pepper 2 pounds of chicken thighs (2 1/2 pounds if they have the bone in) place on a baking sheet and put in a preheated 500 F oven. Cook for about 20 minutes turning them over at the 10 minute point. You want them cooked enough so you can shred them but not overcooked and dry. Conversely you can cook this in a little oil stove top. I think it’s easier in the oven. While they are cooking… pour 1/4 cup of flavorless oil like Sunflower into the bottom of a large pot over medium high heat. When the oil is hot, but not smoking add: 1 large roughly chopped cooking onion, 1 large peeled carrot (sliced into 1/2″ disks) and 1 large Poblano pepper, de-seeded and roughly chopped. 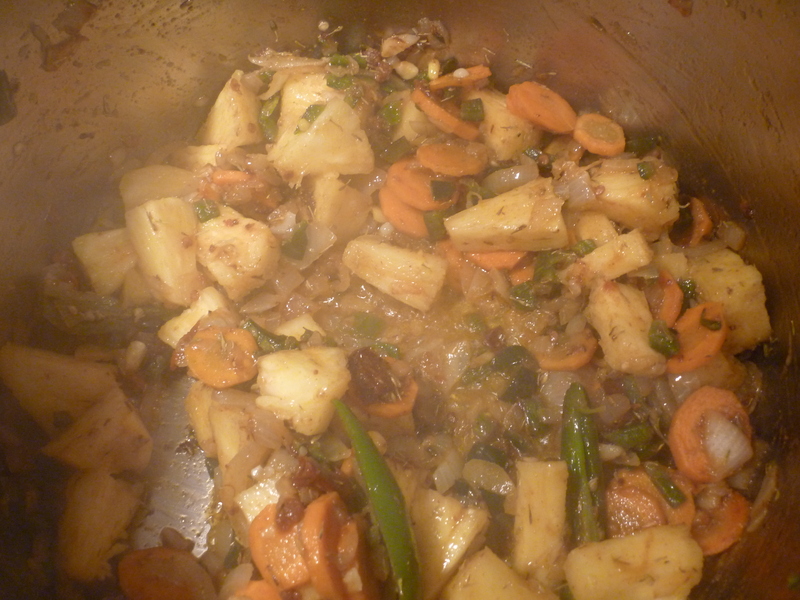 Cook until the carrots are soft and the onions are translucent (no more than 10 minutes). Add to this mixture: 8 garlic cloves finely chopped, 1 cup of roughly chopped fresh Pineapple, 2 Teaspoons of ground Cumin, 1 tablespoon of fresh Thyme, 2 finely Chipotle Peppers (from the canned Chipotle in Asado that are readily available in latin groceries, reserve the rest of the can in a sealed container in the fridge – they keep well) and 1 large Jalapeno pepper quartered lengthwise with seeds. 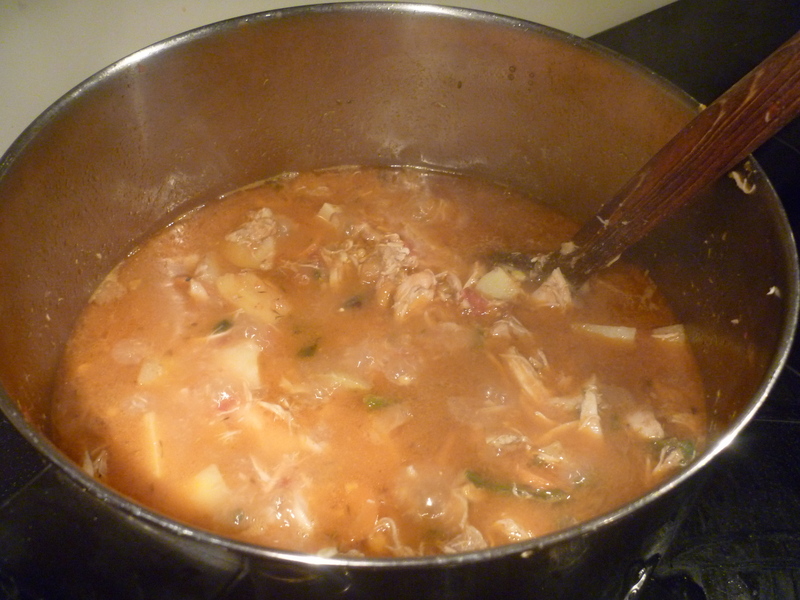 Stir well and cook until nicely fragrant – a few minutes. 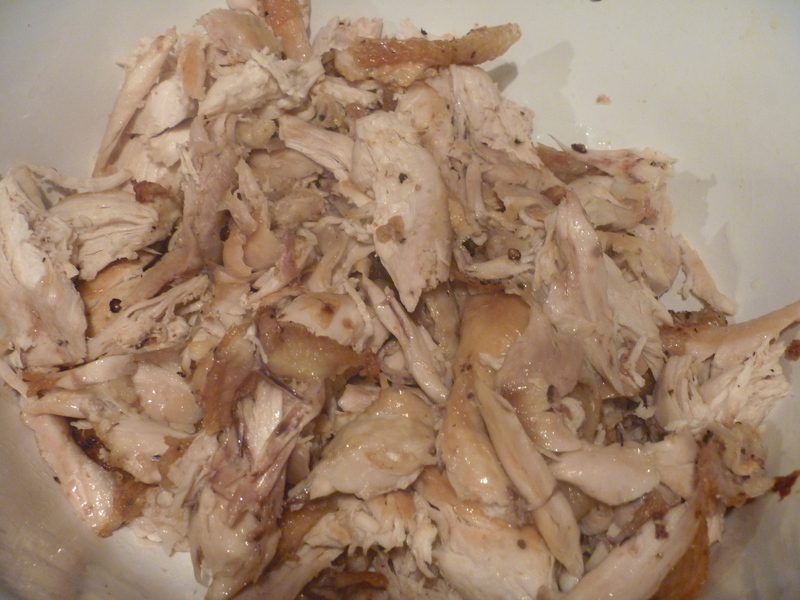 At this point you can turn the heat off and wait for the chicken, when it is done let cool about 10 minutes then shred it – if there are bones discard – I like crunchy cooked chicken skin and would add it, but your call. 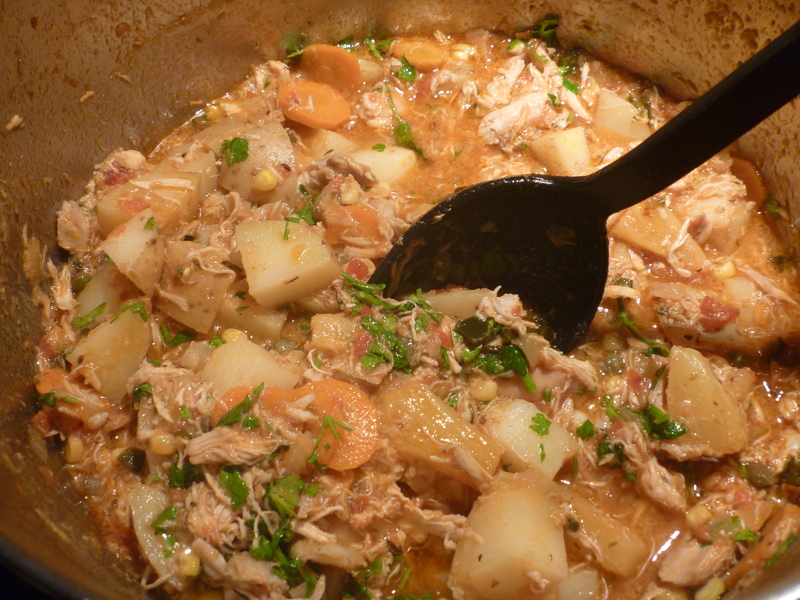 When the chicken has been shredded add it to the stew along with: 1 15 ounce can of crushed tomatoes (or 4 large fresh), 1 pound of potatoes (I like fingerlings or Yukon golds for this – cut into bite size pieces) 4 cups of chicken stock, 3 large sprigs of Epazote (or 1/3 cup of chopped Cilantro) and the kernels of 4 Cobs of Corn (about 1 1/2 cups) bring the mixture to a boil then reduce the heat and cook at a simmer until the potatoes are soft but not mushy. At the very end add the juice of 2 Limes and 3 Tablespoons of Capers. Season generously with salt and freshly grated black pepper, taste and adjust. Garnish with chopped Cilantro. Fry up 8-10 slices of good lightly smoked bacon. When crispy dry on paper towels and reserve the cooking fat – you want 1/4 cup. 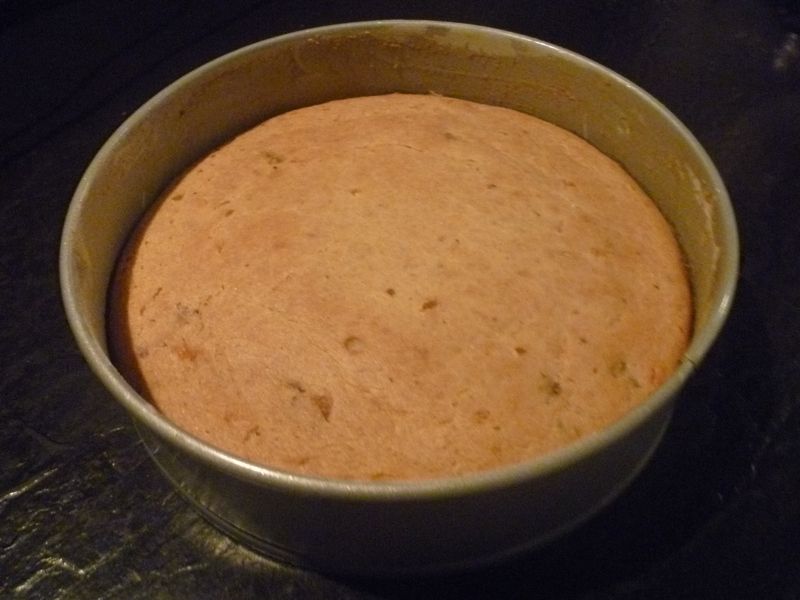 Butter and flour a 9″ square baking tin. In a large bowl add: 1 1/3 cup all purpose flour, 2/3 cup corn meal – locally ground organic is best – 1/3 cup brown sugar (firmly packed), 1 1/2 teaspoons of Baking Powder, a scant teaspoon of Baking Soda, and a scant teaspoon of Kosher Salt and a generous grating of black pepper. Mix. Melt 1 stick (8 tablespoons) of unsalted butter. Once melted add to it 1/4 cup of reserved bacon fat. Finely chopped the cooked bacon and add it to the dry ingredients. In a medium size bowl whisk 2 large eggs with 1 1/2 cups of buttermilk. Stir in the melt butter and bacon fat and all at once add to the dry ingredients. Stir until just mixed and pour into the prepared pan and place in the oven. Cook for about 30 minutes, it should be nicely browned and firm in the middle. Let cool before slicing. 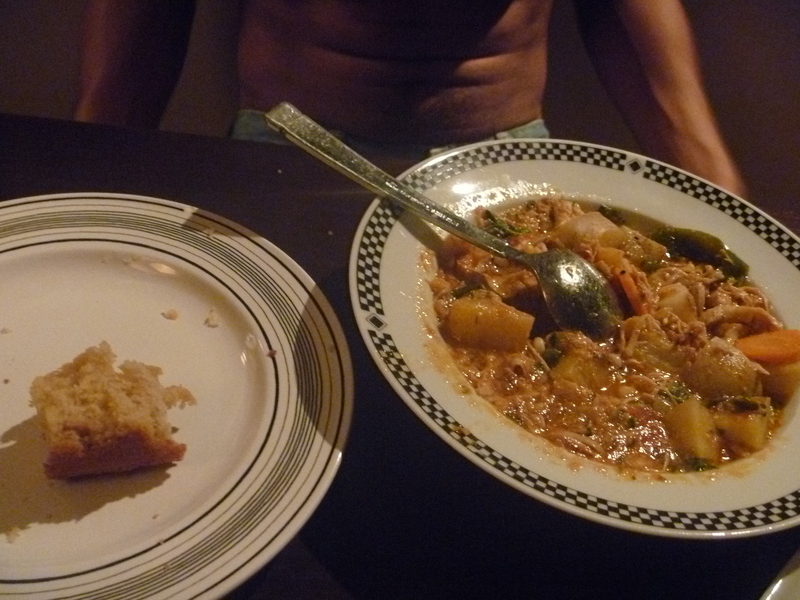 I have to admit I was on Fire Island when I made this in a sub par kitchen so all I had was a springform pan which was I believe 9 inches, the bread doesn’t rise a tremendous amount so I don’t think you should have any problems, but if you do make this I would love to hear your thoughts – I think this is the best corn bread ever! 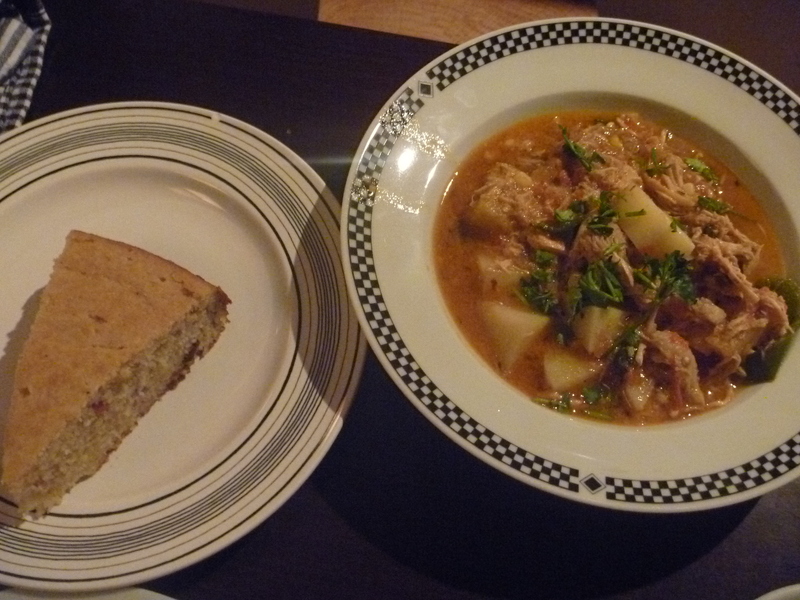 This entry was posted in Recipes and tagged bacon corn bread, guisado de pollo. Bookmark the permalink.